Well, you’ve probably already heard this, but Full House is back. Well, it’s Fuller House now. I’ve only seen 1 1/2 episodes by now as I just can’t really get into it. It does bring back a lot of memories though. All that time when I was watching the first episode, I kept thinking “OMG I really was DJ!” I loved Full House when I was a kid and I really felt like D.J. alllll the time. My cheeks were just as chubby, I had long brown hair styled the same way, I even wore similar clothes. I could try to find some pictures for you guys, but I’m a bit too embarrassed for that. My cheeks and hair are still the same though, luckily the clothes are different. But I did end up digging up some photos anyway, just to show to Rok. And it’s then that I realized I never print out photos anymore. Do you do that? I always say I’ll make an album and I have two empty ones sitting on a shelf, but I just can’t get myself to go through piles of photos on my computer and make a selection. It’s too hard! Back when we used a film camera, all you could do is just drop the camera at the photo studio and hope the photos all turn out fine. Now I can take as many photos as I want, which is always too many and I have them sitting on my disk. I really need to work on that. I was going through my Amsterdam photos (some I shared here) the other day and realized I still haven’t made that killer Amsterdam sandwich. It’s an Old Amsterdam sandwich Rok and I always bought at AH, because it was not only cheap but really tasty too. Now, granted, this cheese mustard veggie sandwich that I’m sharing isn’t an exact copy of that one, because I forgot to write down the ingredients list, but it comes pretty close. It’s very simple and it really reminds me of Amsterdam. It’s two pieces of whole grain toast, slightly toasted, smeared with mayonnaise and Dijon mustard. And you know how much I looove mustard (latest example being this mustard sour cream potato salad). 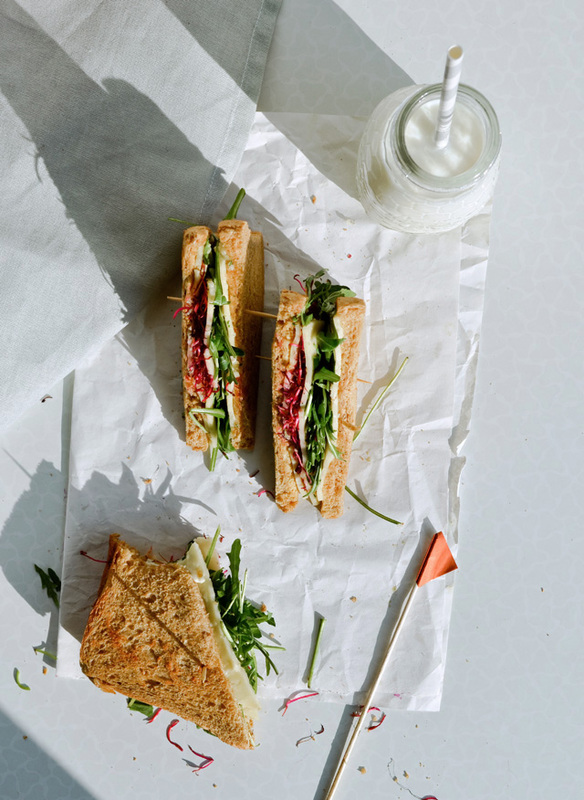 The mayo is more on the sweeter side, so tangy mustard gives the sandwich the kick it needs. 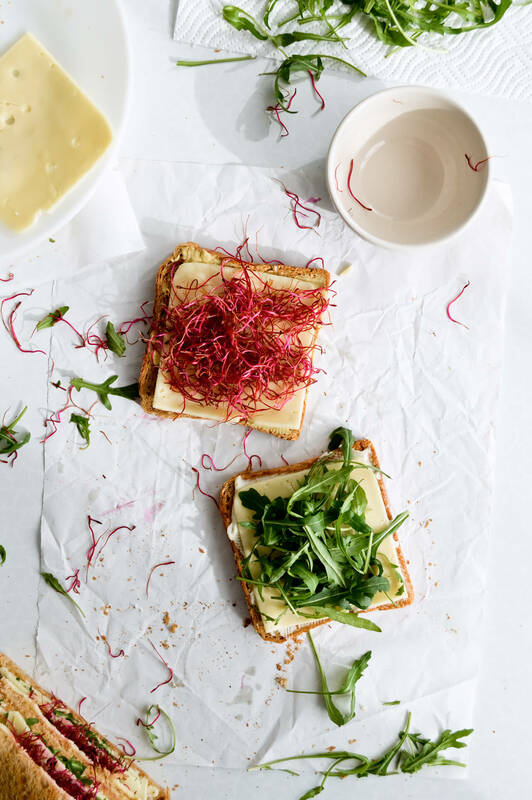 These two flavors – sharp and mild – are duplicated with fresh arugula and beetroot sprouts, both give the sandwich a nice crunch. Lost in all these flavors are three slices of cheese. That Amsterdam sandwich was filled with amazing aged gouda by Old Amsterdam. So, of course, I put gouda in my sandwiches. If I don’t have that Maasdam is amazing too. 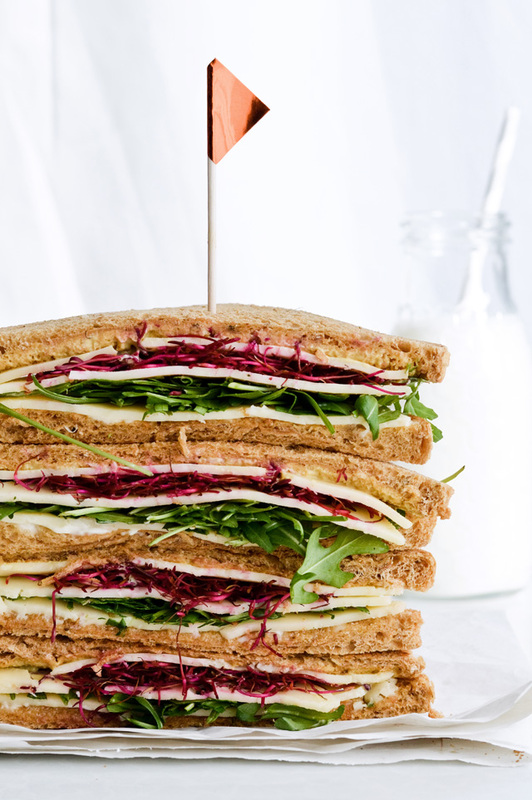 It’s a Swiss-style Dutch cheese with a strong flavor, just what this sandwich needs. 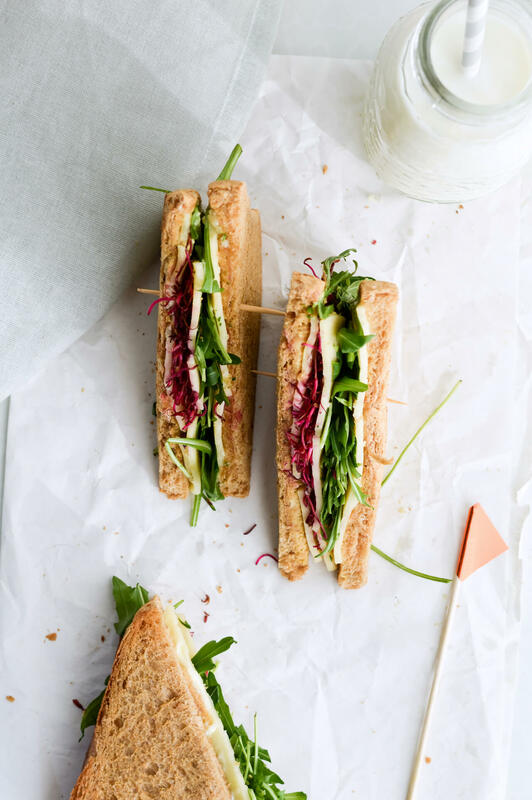 This cheese mustard veggie sandwich is my favorite at lunch time and sometimes, when I want a lighter dinner, I have it in the evening too. 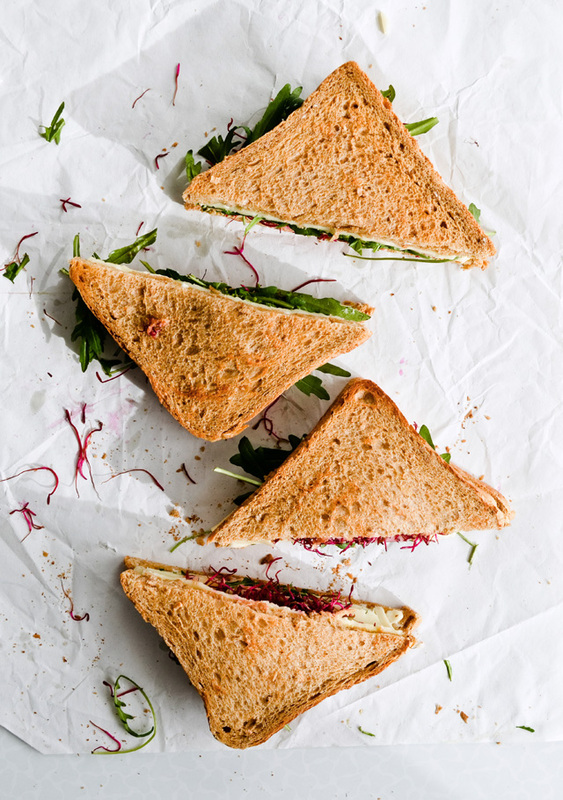 A perfect quick lunch, this sandwich is tangy, cheesy, filled with veggies that give it a crunch. 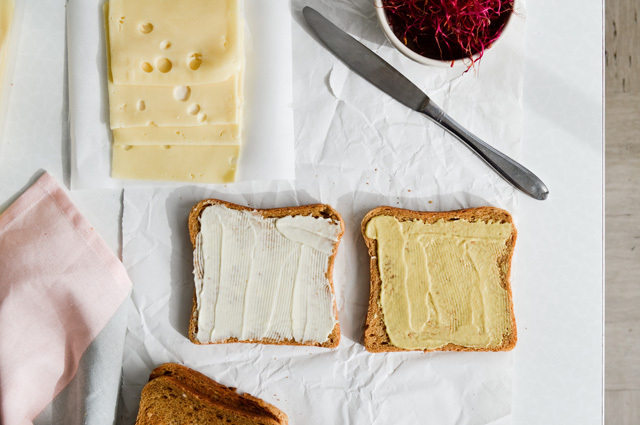 For one sandwich, spread 1 tablespoon mustard on one toast, 1 tablespoon mayonnaise on another toast. Top each with a slice of cheese. 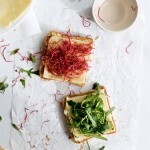 Place some arugula on the mayonnaise toast and a small handful of sprouts on the mustard toast. Lastly, add another slice of cheese on either toast, then combine the two halves. Serve as is or cut into half diagonally. 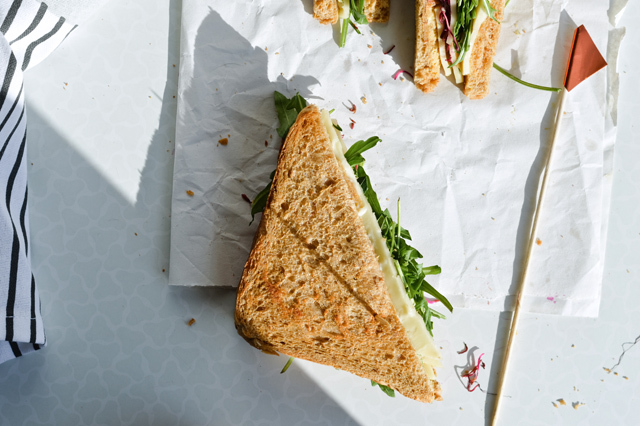 Make the second sandwich the same way.